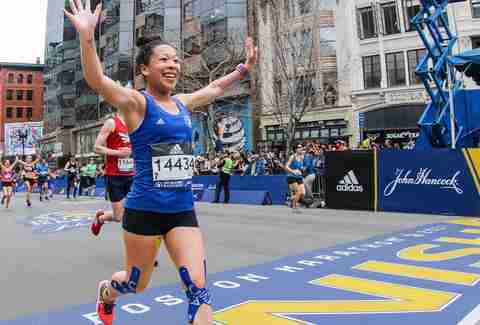 Patriots’ Day, which falls on April 15 this year, is practically here, which means runners across the world are gearing up for the 123rd Boston Marathon. The 26.2 mile-long race will welcome over 30,000 participants and is expected to draw in nearly one million spectators. Not bad considering the city recently celebrated both the Super Bowl and St. Patrick’s Day parades. But if there’s one place that can do it all, it’s Boston. 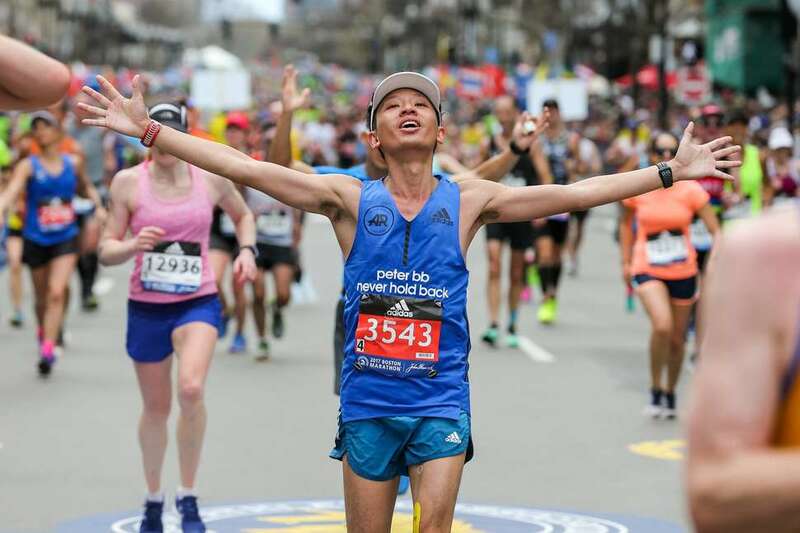 With over a century of historic moments and awe-inspiring stories, the Marathon exemplifies the slogan “Boston Strong.” The colossal crowds showing up to offer support and enthusiasm (an understatement) serve as a reminder to the race’s importance to the city and beyond. Whether you’re lacing up your sneakers, losing your voice from the sidelines or watching while “working” from home, we’ve got you covered with a go-to guide to Marathon Monday. Runners will have until 5:30pm to cross the finish line as awards commence at the Fairmont Copley Plaza from 5-6pm. Participants gather at the starting point in rural New England town Hopkinton and wrap up the 26.2 miles at the famed finish line on Boylston Street in Copley Square. Along the way, runners pass through Ashland, Framingham, Natick, Wellesley, Newton, Brookline before entering downtown Boston. Check out the Boston Athletic Association’s course map, pointing out prime spots for spectators, hydration stations, mile markers and more. How do I keep track of a runner? If you’re keeping your eyes peeled for a specific runner, you can track them via the BAA website or free app. You can also sign up for text alerts, which beats running alongside them the entire time. The starting line in Hopkinton: To help hype up the runners before they hit the road, you might want to head to Hopkinton for the first moments of the race. If you tire yourself out from the initial excitement, Start Line Brewing isn’t too far away for a much needed seat and beverage. Lake Cochituate in Natick: If you’re into prime New England scenery, finding a spot along Lake Cochituate is worth traveling for. Yes, we’ve been lucky to see the sun for the past few weeks but we advise refraining from taking a dip. Scream Tunnel in Wellesley: A famous tradition that has continued since the early beginnings of the Marathon, Wellesley College’s Scream Tunnel provides the noise deafening cheers… and an occasional kiss? That’s right, some signs from students offer more than words of encouragement, with requests to steal a kiss from the runners. Take a peek at The Scream Tunnel’s Facebook page for this year’s collection. 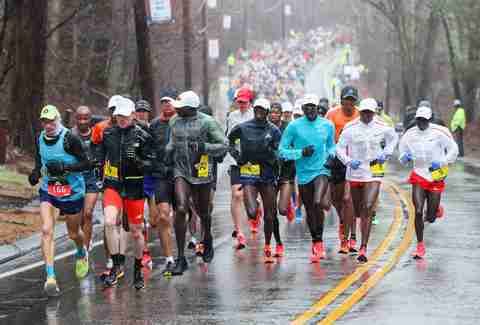 Newton's Heartbreak Hill: Around the 20-mile mark, runners are challenged to a steep half-mile uphill. Debated as one of the toughest parts of the course, Heartbreak Hill tests runners as they grow closer to the finish line. When we say closer, we’re talking 6 miles left -- piece of cake! Boston College: Once runners leave Heartbreak Hill behind, they’re greeted by crowds on crowds of Boston College students. Who better to bring energy and enthusiasm to all of those participating than college students? Their ability to hang is like no other. Coolidge Corner: A beloved spot in Brookline, Coolidge Corner has shops, restaurants and a Trader Joe’s to meet your post-race entertainment needs. Fenway-Kenmore: With the Red Sox game starting at 11am, fans pour out into the streets to catch runners on their last mile. With plenty of activity happening in the Fenway Park area on Marathon Monday, you could be looking at a very long day and ultimately long night. Copley Square: The finish line on Boylston Street will bring the biggest crowds and emotions - you won’t want to miss it. It’s best to arrive as early as possible to ensure high fives from the finishers and a chance to actually see your surroundings. If navigating through crowds isn’t your biggest strong suit, you can also stream the Marathon on CBS Boston or NBC Sports online. What are the events around the race? For the first time ever, the BAA is hosting a "Fan Fest" -- a free and open to the public event in Copley Square held the weekend leading up to the Marathon. Fan Fest will feature live music, former champions and a clinic for runners to receive final tips on how to conquer the race. On Monday, the Post-Race Party commences at Fenway Park, with more live music, concessions and your chance to ask as many people as possible, “how?” Tickets are $30 each. Jillian Hammell is a contributor to Thrillist.